There could be instances when you prefer to keep some of your deals and customer interactions private (or visible to select team members). 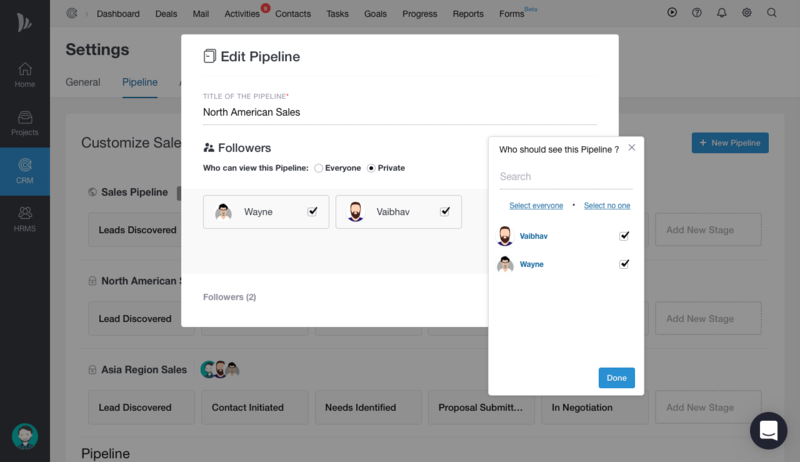 You can choose to keep your Pipelines 'Shared' (visible to all CRM Users in your organization), or you can also make a Pipeline 'Private' (visible to only you or select CRM Users). Note: Only followers of a Private Pipeline will have access to its Deals, Activities, Tasks, Forms, Goals, and Reports. CRM Admins and Account owner can 'Add and Remove followers' for any Pipeline they have access to. They can also manage followers of any Pipeline while adding a new Pipeline and editing an existing Pipeline. Default Pipeline will be open for everyone, hence cannot be made private. All the Pipelines will be visible to the Account owner.